What do we call it when the uncertain vegetarian is staring at a block of tofu and has no idea how to take this bland, white piece of supposed-to-be-good-protein and turn it into dinner? I say that is a budding chef who simply needs some “FLAVORINATION!” You know . . . to imagine some rich and piquant flavors that would please the palette and make that blank block of tofu into a taste sensation. Now don’t get me wrong. I’m not saying all tofu is completely flavorless. Three friends and I once spent an evening making our own tofu starting from scratch with soy beans. We toiled and waited and cleaned up messes and drank some sake and followed the directions and strained and curdled and after several hours we had produced two pounds of the freshest tofu any of us had ever had. It looked sooo good and that was the beginning of the end. Once we started to taste it, it was so incredibly wonderful and flavorful–just by itself with a splash of shoyu–that two pounds of tofu was gone in about fifteen minutes. Memorable experience, but I never again invested that much time and effort to make tofu–only to have it scarfed up immediately. Besides, I no longer drink sake. So. You’re at your food store and you’re staring at packages of soft, firm and extra firm tofu. You also notice there is tofu in little aseptic boxes. Which one should you buy? Knowing that soybeans are near the top of the list of genetically modified foods, you definitely should consider buying organic tofu. Organic foods are not supposed to contain GMOs. All tofu is stored in water and it should be spring water, so check the package for that. Firm or extra firm tofu is great for stir-frying, broiling, coating and deep-frying or baking or for soups. Soft tofu is, well, softer and not as dense. It too can be used for soups and it is also good for dips and dressings that you will be blending in a blender. Silken tofu is also great for blending and is often the tofu of choice for smooth luscious tofu desserts such as a mousse or pudding. Now . . . the way I was brought up on tofu, we wouldn’t usually mix tofu with sweets and certainly not with sugar. That is not a balanced preparation and not terribly digestible. I know. I know. The modern Japanese use tofu with sugar and all kinds of things with sugar. That is not traditional. They pay for their adoption of western ways with an incidence of cancer they never had in the good ol’ days. My point here is that whatever you marinate, cook, blend, sauce or coat the tofu with is going to make the flavor of the tofu. And just because I am in a friendly mood and don’t want to be too preachy about how you should take your tofu, I’m going to give you a suggestion for a barbecue-style tofu marinade. This is not a recipe per se, just a concept to get you started. You use your FLAVORINATION to put it all together. I would combine red miso, garlic, olive oil, perhaps some tomato paste, and a bit of barley malt (a complex carbohydrate made from whole barley–sweet, but not like sugar). I’d probably add some red pepper flakes or chile powder and a dash from a little bottle of red stuff called “Texas Champagne.” It’s a hot sauce. Then I’d taste this concoction and see what else it is asking for. You’ll probably add a little water and vinegar to give it that “saucy” consistency. While preparing this sauce, slice extra firm tofu in 3/4 inch slices and lay them out on paper towels to drain off some of the water. You can even put paper towels on top of the slices and put a cutting board or weighted flat pan on top to press out the water even more. Then marinate the tofu in the BBQ sauce for a minimum of an hour so you really get the flavor into the tofu. Broil it or pan-fry it or even grill it. Garnish with something green–chopped parsely, fresh chopped basil–whatever your FLAVORINATION dreams up! Okay, okay! You talked me into it. 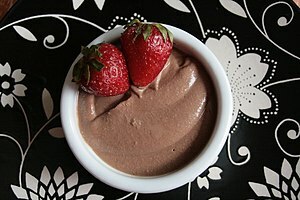 Take a quick walk over to Christina Cook’s website and look at this very easy to make dark chocolate mousse recipe. And no sugar in it. It’s sweetened with dates and I’m going to try it too! This entry was posted in Cooking, Food and tagged Barbecue sauce, barbecue tofu, creating recipes, flavorination, tofu by mycookinglifebypatty. Bookmark the permalink. Thanks, Kathy! Yes it seems we ripened on the same vine when it comes to food. And yes I did coin the word flavorination. I even Googled it and didn’t find that exact term. It’s my vocabular tomfoolery, Kathy!